If investor/trader reaction last Friday to financials’ 1Q18 results is any indication, we are in for some interesting weeks ahead. First-quarter earnings season began in earnest last week. 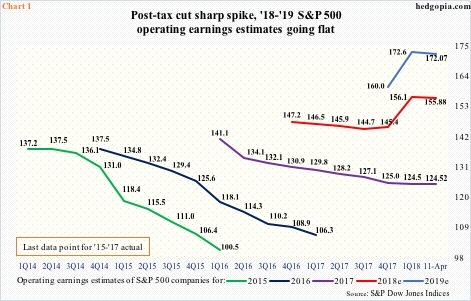 For 1Q18, the sell-side expects $35.63 in operating earnings from S&P 500 companies. Estimates have slightly trended lower since hitting $35.81 on March 8, but have risen post-tax cuts. The Tax Cuts and Jobs Act of 2017 was signed into law on December 22. Estimates were $33.87 on December 21. The upward revision trend over the past four months is evident in Chart 1. On December 21, consensus estimates for 2018 were $145.31, before gradually rising to $156.45 by mid-March. As of April 11, estimates slightly edged down to $155.88. Over the past few weeks, the trend is flattish to slightly down. Ditto with 2019, which peaked at $173.11 at the end of February, and stood at $172.07 on April 11. Last Friday, some of the leading US financials reported their numbers. JPM (JP Morgan), C (Citigroup), PNC (PNC) and Wells Fargo (WFC) all beat estimates, but ended down 2.7 percent, 1.6 percent, 4.6 percent and 3.4 percent, in that order. 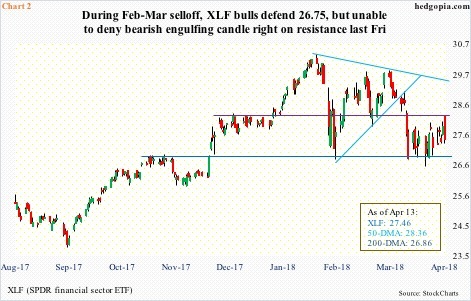 XLF (SPDR financial sector ETF) lost 1.5 percent, with the session producing a bearish engulfing candle (Chart 2). The ETF reached a 10-year high of $30.33 on January 29 before reversing lower. The subsequent drop bottomed at $26.76 on February 9. It then proceeded to trade within a symmetrical triangle, which it fell out of on March 19. The underside of that broken triangle already repelled rally attempts. Last Friday’s reaction further worsens the technical picture. Ideally, the bulls would have liked to go test the upper bound of the triangle, but they fell way short. Friday’s high also fell $0.12 short of the 50-day moving average. This also applies to major US equity indices. In fact, guess where sellers showed up on the Dow Industrials last Friday? 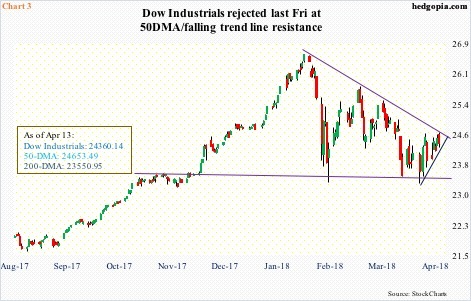 At the 50-day, which also approximates the upper bound of a descending triangle (Chart 3). The Industrials suffered an 11-session peak-to-trough, 11.2-percent decline during late January-early February. It has since consistently made lower highs. The bulls cannot afford to lose support at 23550, which is where the 200-day rests.